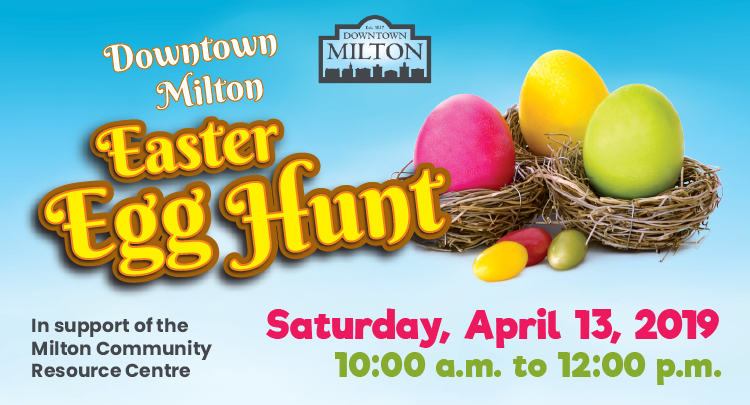 Join us on Saturday, April 13, 2019 from 10:00 a.m. to 12:00 p.m. for the Downtown Milton Easter Egg Hunt! Hunt for Easter treats and join in fun activities at participating businesses. Be sure to bring your Easter baskets and wear your bunny ears! Main St. E. will be closed to vehicles from Martin St. to James St. for the event to ensure everyone stays safe. This year we are partnering with the Milton Community Resource Centre (MCRC) to help them raise funds and collect donations for their Infant Food Bank. 100% of all donations to the Infant Food Bank will go directly toward purchasing formula, diapers, and baby food for local families. Click here to see the event map. The Office of MPP Parm Gill will be hosting a free pancake breakfast at the event! Hot pancakes with local maple syrup will be served starting at 9:30 a.m. The egg hunt officially begins at 10 a.m.
Show off your Easter Bonnet* for a chance to win. Here’s your chance to show off your creativity by taking a selfie in your best Easter Bonnet*. Proceed to the Selfie Station located in front of Knox Church. Take a photo on your mobile device at the selfie station and post it to Facebook and tag @downtownmilton with the hashtag #MustDoInMilton. Winners will be chosen from the pictures that were taken at the event selfie station and posted by 11:59 pm Sunday, April 14, 2019. We will announce one winner on our Facebook page in each of the two categories by Wednesday, April 17th. 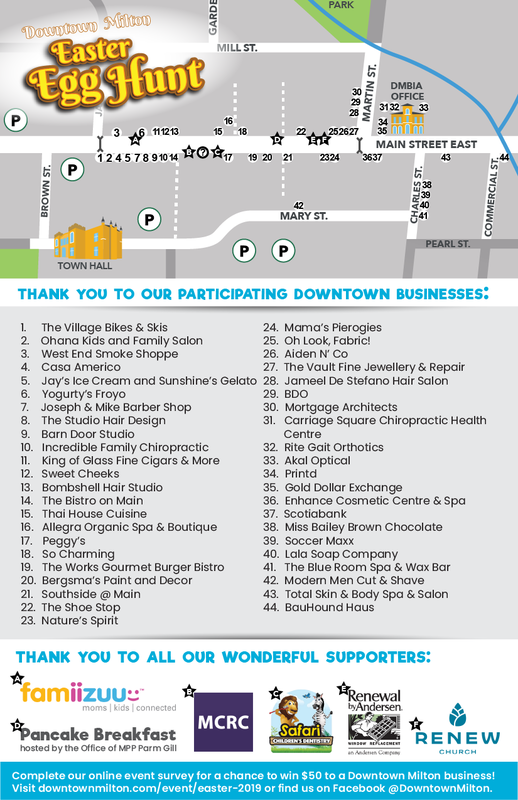 Winners will receive a $25 gift card to the Downtown Milton Business Improvement Area business of their choice. Click here to view our business directory. *Bonnet can be a hat, fascinator or headband. *Business must be a part of the Downtown Milton Business Improvement Area. See our business directory.